China has recovered significant records of the Old Summer Palace from a recent effort to trace and document relics taken from the garden that are now in foreign countries, a park official said yesterday. A team of experts has collected several hundred photos of the historical royal garden during their recent trip to the United States where they visited museums, libraries and private collectors, Chen Mingjie, director of the park's management office, told China Daily yesterday. The team has also discovered and taken photos of several pieces of looted relics from the garden that were previously unknown to the Chinese authorities, including a painting dating back to the Song Dynasty (AD 960 to 1279). Previously part of the garden's collection, the painting is currently on display in the Boston Museum, according to Chen. Historical records made by Western scholars about the garden were also collected during the trip, Chen added. "Our US trip, with the main purpose to document rather than to seek a return of those relics, has proved fruitful," Chen said. "These documents will definitely help build a clearer view of the Old Summer Palace, then known as the 'Garden of Gardens' before it was looted and burned down in 1860 by invading British and French armies." China sent a team of experts to the United States between Nov 29 and Dec 16 as part of the attempt to build a complete database of the Old Summer Palace's lost relics. The attempt also includes sending the team of experts to the United Kingdom, France, Japan and China's Taiwan province for the documenting effort in the rest of the year. Like other ancient civilizations, China saw many cultural relics taken overseas when the country was subjected to wars and occupation. According to the Chinese Cultural Relics Association, more than 10 million Chinese cultural relics were taken from the country between 1840 and 1949, a large number of which are now stored at major public museums in Europe and the US. The number of relics plundered from the Old Summer Palace alone is estimated at about 1.5 million, currently housed in more than 2,000 museums in 47 countries. A majority of them are being showcased in the British Museum and the Fontainebleau Art Museum in France, Chen said. But retrieving lost relics in foreign countries can be a rocky experience, as proved in the controversy surrounding the auction of two looted fountainheads from the Old Summer Palace by Christie's in February 2008. Despite extensive opposition from the Chinese and international communities, the auction giant sold the two fountainheads for 14 million euros ($17.9 million). However, the event brought much public attention to the historical royal garden, which will commemorate the 150th anniversary of its destruction in October. "We do hope more previously unknown relics will surface and some might be returned to our country during our tracing effort," Chen said. "But above of all, we hope to build a complete catalogue of lost relics housed in foreign countries by the end of this year." 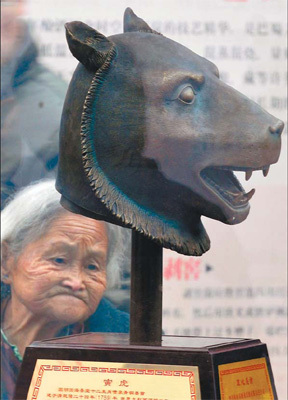 The park revealed the newly discovered documents and relics through a photo display in Chengdu yesterday. Chen said the exhibition will soon move to Beijing and he hopes more discoveries will join the exhibition once the expert team finishes its tracing effort in other countries. "We hope it happens before Oct 18 when a multinational forum will take place to commemorate the 150th anniversary of the garden's destruction," Chen said. For the event, the park plans to invite guests from around the world, including the British prime minister and French president, whose troops were responsible for the garden's destruction in 1860, according to Aisin-Gioro Baoxun, deputy director of the preparatory committee. The commemoration aims to preserve cultural heritage for humanity instead of hatred, he said. "We rally together to remember the history, not the sin, and pray for a peaceful world," said Aisin-Gioro. An average-looking man of medium height, Zhang stands out from the crowd as the operator of charity website Owe China, (www.owecn.com).